Thinking of planning a trip to northern Michigan to visit one of the few car-free islands in the U.S.? Wondering what there could possibly be to do during a visit? Well, look no further. 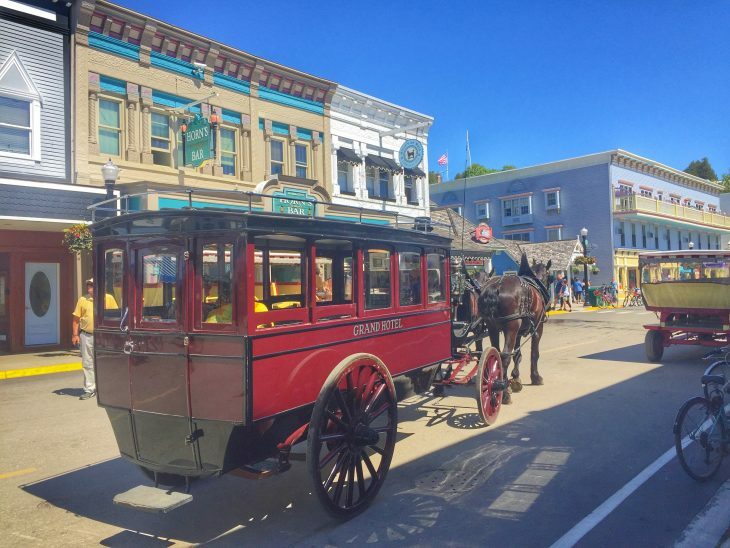 I’m sharing all the best activities on Mackinac Island plus many of them are FREE! 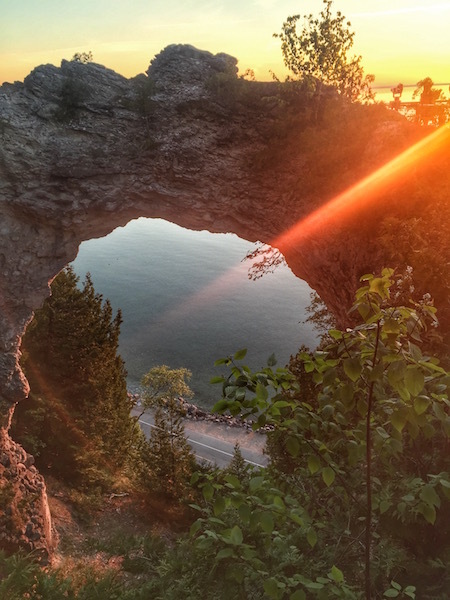 Start packing because there are many things to do on Mackinac Island and you won’t want to put it off another summer! Note: This post has affiliate links. 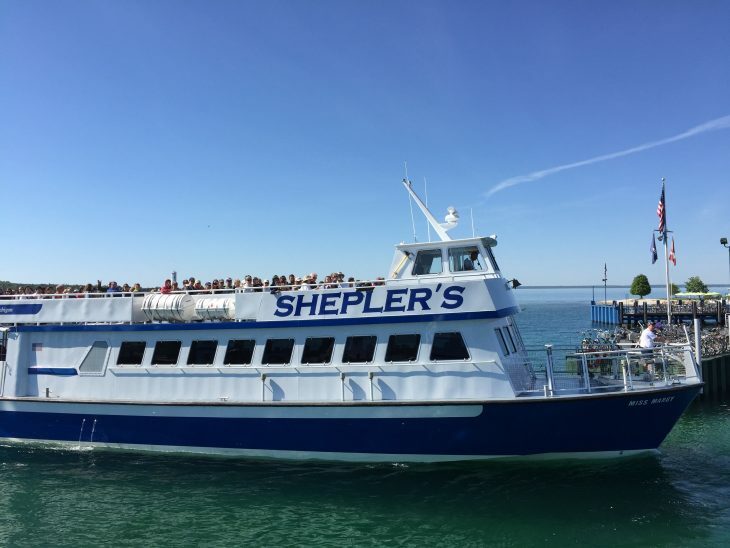 Now that you’re excited about your visit lets look at the things to do on Mackinac Island while you are there. 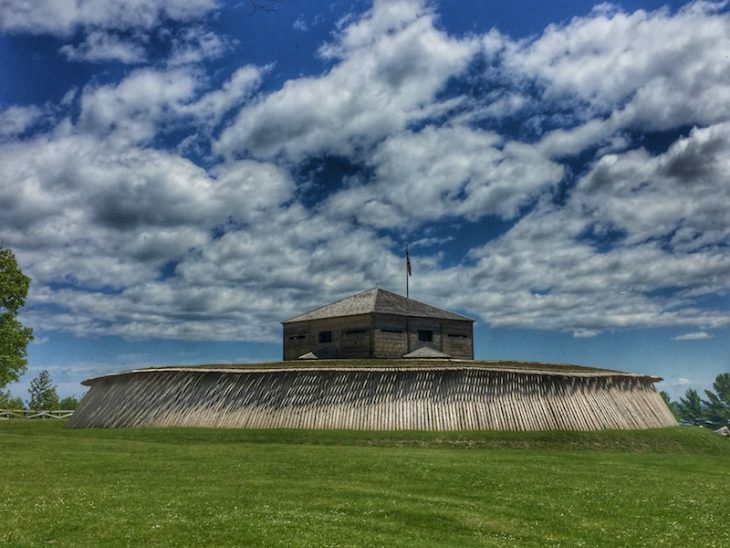 Even if you aren’t a history buff you are going to enjoy a visit to this very historic site. Make a day of it at the Fort. 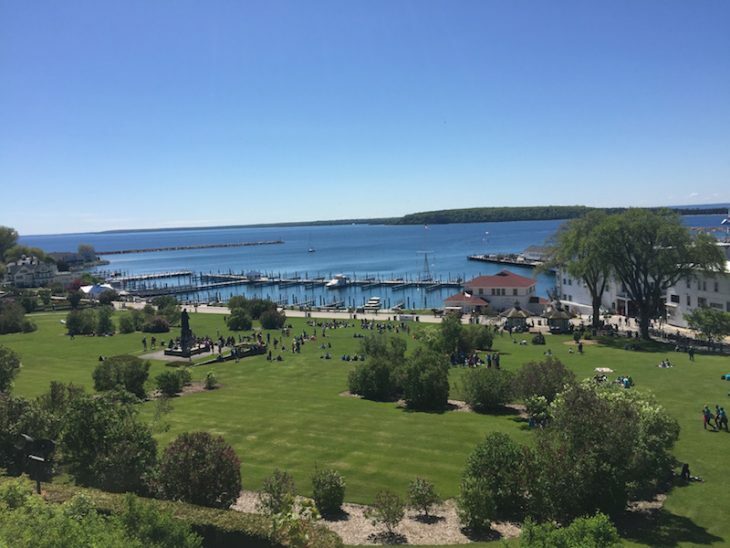 Learn about life during the early days on the island, arrive early and ask if you can fire the 9 am canon, have lunch at the tearoom offering excellent views of downtown Mackinac Island and the Straits of Mackinac, and stay late for the Murder, Mystery & Mayhem tour. Last Admission 3:00 p.m. Admission is ONLY at the Avenue of Flags or north entrance. 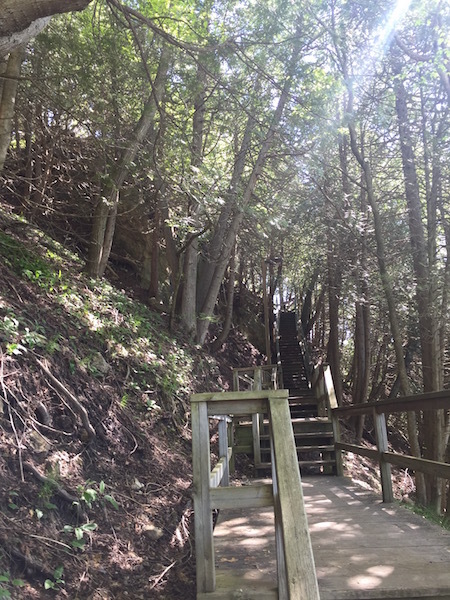 The island has miles of excellent hiking trails. The best part? Since you are surrounded by water it’s hard to get lost. Be sure to wear good hiking shoes. In the early summer look for Lady’s Slipper and Trillium in bloom. 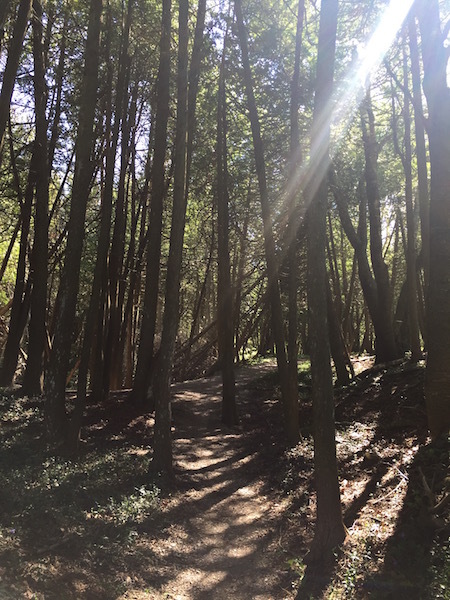 Walk past the back entrance to the Fort, take a right on the road that leads to the Fort administrative offices and then veer to the left onto the hiking trails. You’ll pass the Somewhere In Time Gazebo, follow the path into the woods to the right. Continue on and you’ll discover a historic marker with a great overlook of the Straits. 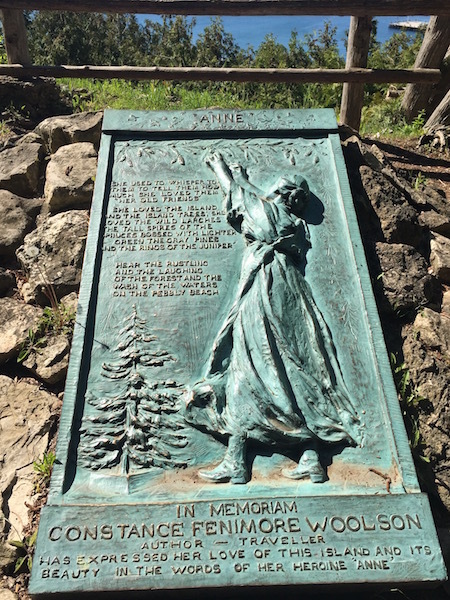 Anne’s Tablet is a tribute to author Constance Fenimore Woolson who spent her childhood summers on the island and became a well-known, early 19th-century author. Her first published novel, Anne (which is currently FREE on Amazon Kindle), is based on the Island and was published in the late 1800’s. The entire island is very photogenic. From selfies to landscapes to action shots your island experience demands to be captured on film. 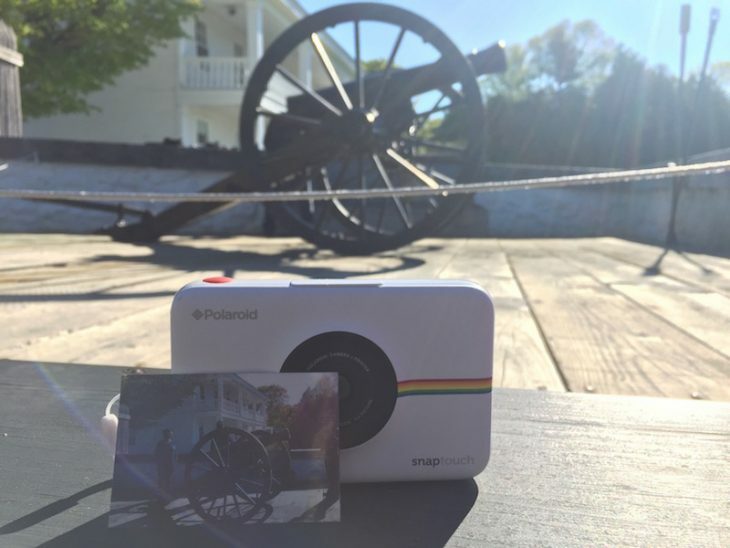 Since Mackinac Island is a bit of a throwback to another time it’s only fitting that you use a camera that is the same. I took my Polaroid SnapTouch with me and had a blast! Nothing like taking a photo and immediately printing it to share with your friends. 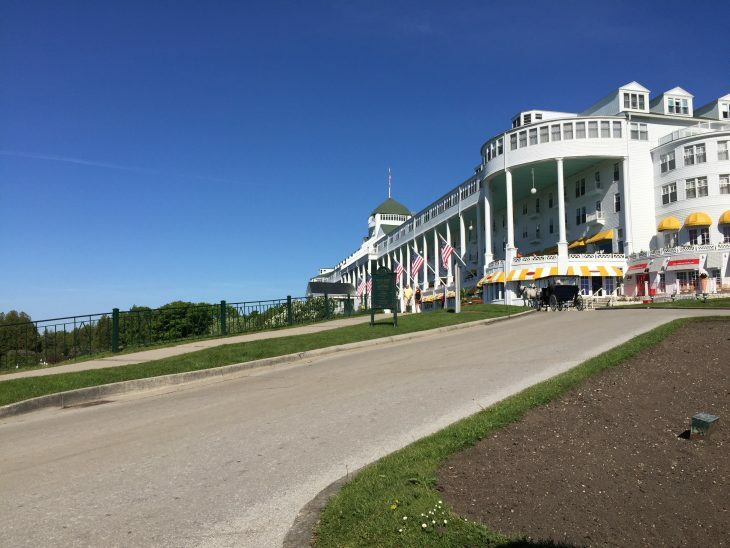 It’s a cult classic and fans flock to the island every year to visit the movie locations and attend the Somewhere In Time Festival held at the Grand Hotel. 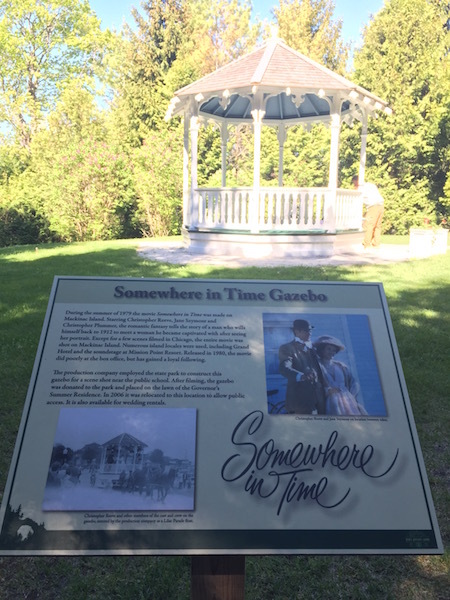 Located near the Fort Mackinac administrative offices is the gazebo from the movie. A great place to sit a spell. Some FREE (fee for Grand Hotel entrance). This is a great way to see many of the islands popular sites as well as hear entertaining stories and enjoy a horse-drawn carriage ride. You can pick up a carriage ride on Main Street as soon as you get off the ferry. Want to explore the island on your own time? Bring a bike or rent one on the island and spend the day pedaling around this roughly 4 square mile island. 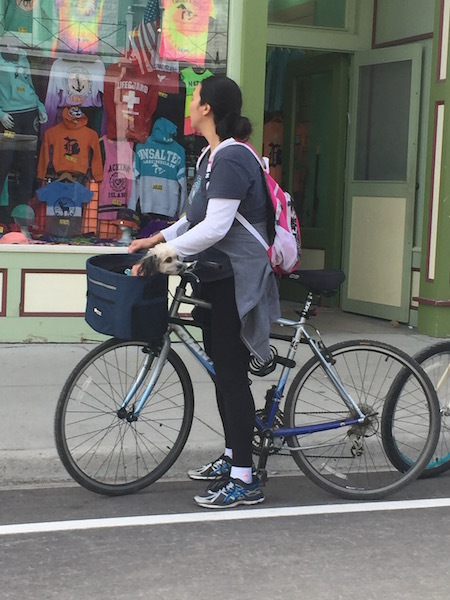 By the way, Mackinac Island is very pet-friendly! 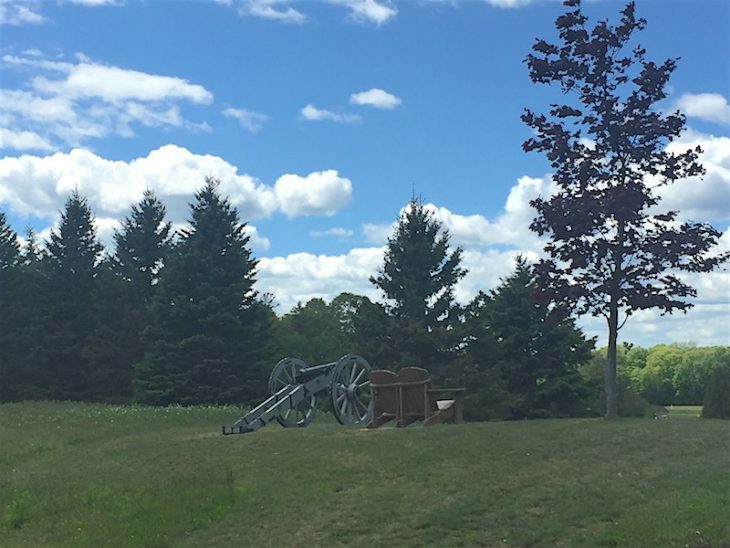 Fort Holmes is part of the Fort Mackinac Historic State Parks and is located on the highest point on the island. It has recently been restored and provides an excellent view of the island. 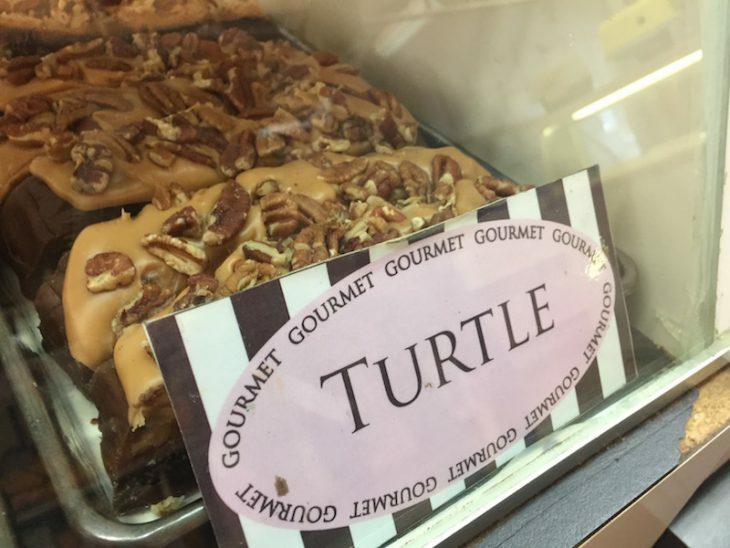 This is an island favorite. Arch Rock is lovely any time of day but at sunrise, it’s quiet and has a pretty golden glow. Rainy day? No worries, head over to Mission Point Resort and introduce the kids to classic arcade games and play some video games. A change machine is available in the arcade. 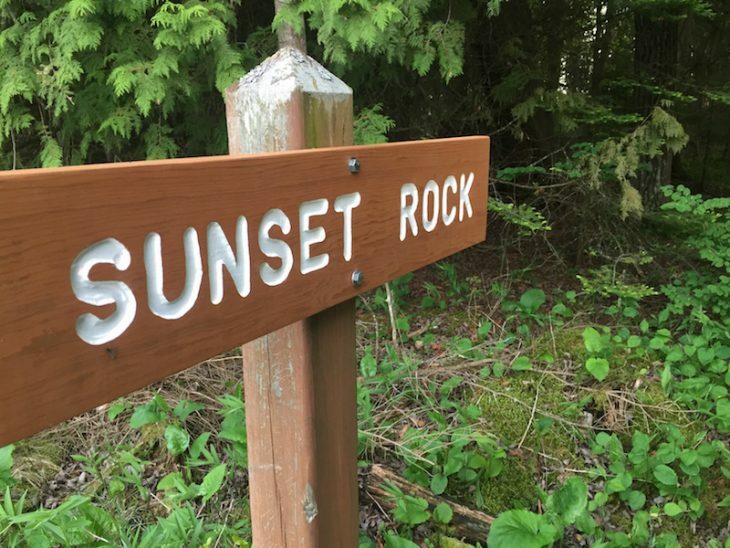 There is a trail behind the Inn at Stonecliffe that winds its way through the woods and eventually leads you to Sunset Rock. 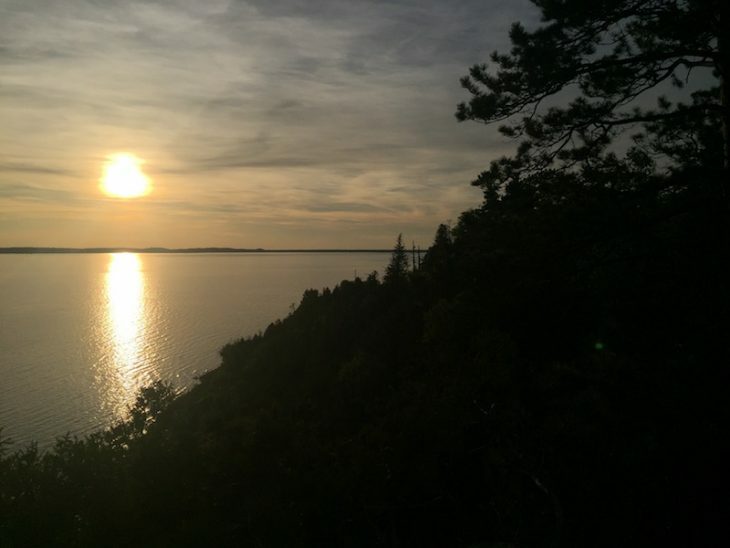 From here you can see the mighty Mackinac Bridge and watch as the sun sets over the Straits. 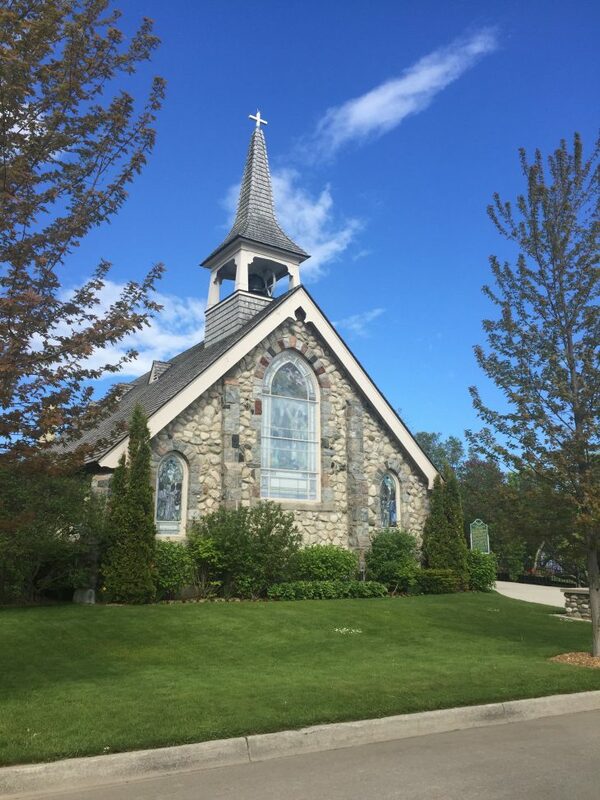 On Tuesdays during the summer head over to St. Anne’s church and get your do si do on as your swing your partner round and round on the church deck. Wawashkamo is an interesting blend of history and today. 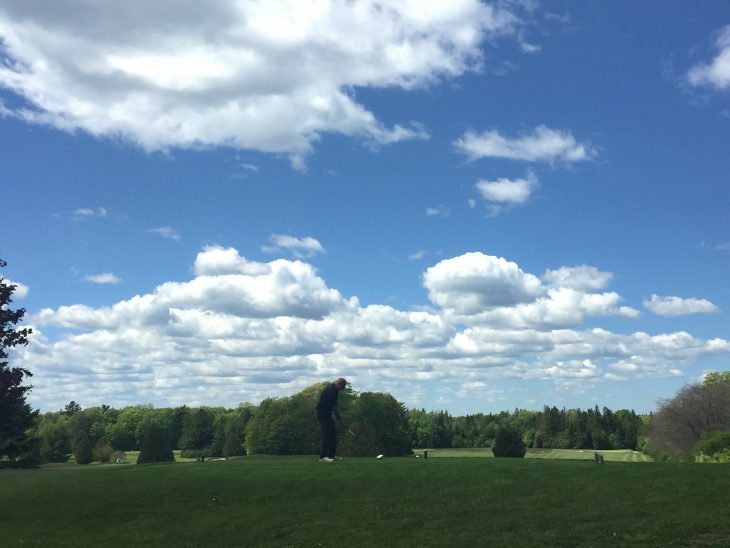 It is Michigans oldest, unchanged, private nine-hole golf course. It was founded in 1898 and that way you see it today is mostly how it was over a century ago. 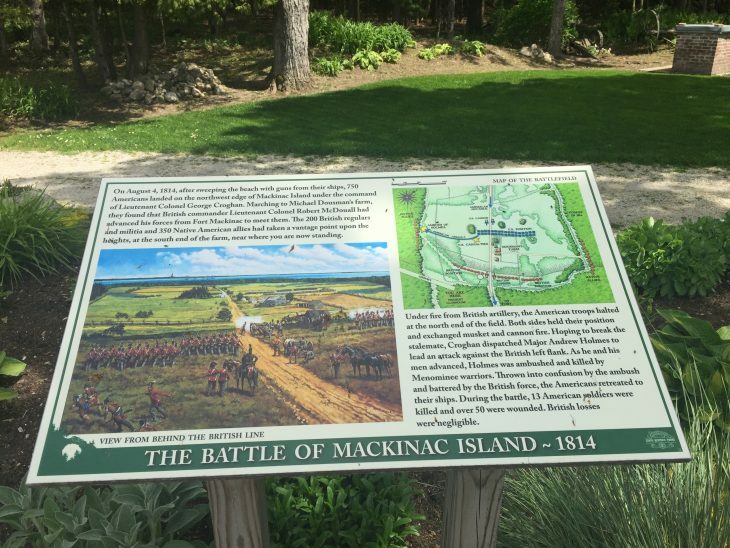 This is also the land of the great 1814 Battle of Mackinac Island. This was once a farmer’s field where American soldiers attempted and failed to drive the British from their hill. When you tee off at the first hole you are teeing off on historic ground. FREE to view, a fee to play. 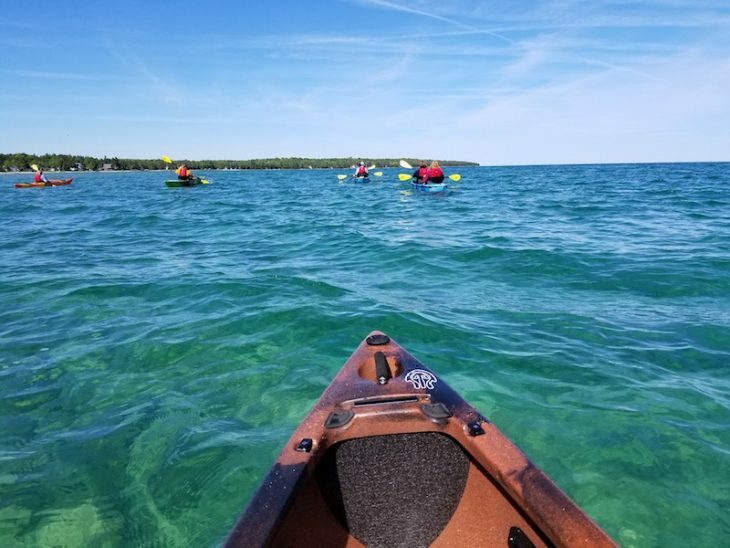 Great Turtle Kayak Tours offers two locations and many tour options for getting out on the water to explore the Straits of Mackinac. The first option is to take a tour from the mainland before heading to the island. Go the Fort Michilimackinac in Mackinaw City and enjoy a paddle to the Fort and under the mighty Mackinac Bridge. That is definitely a bucket list item. 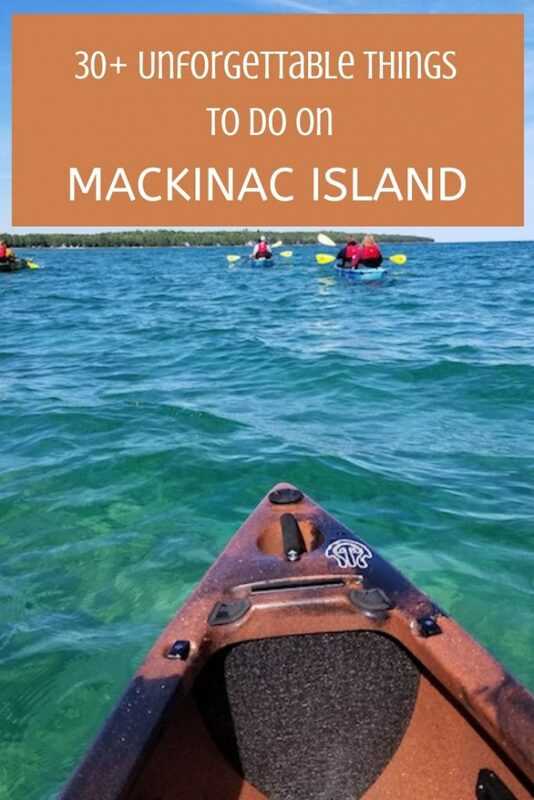 Once you are on the island join Great Turtle Kayak Tours for a paddle to famous Mackinac Island landmarks. SUP is also available. TIP: Be sure to check out the crystal clear waters of the Straits! 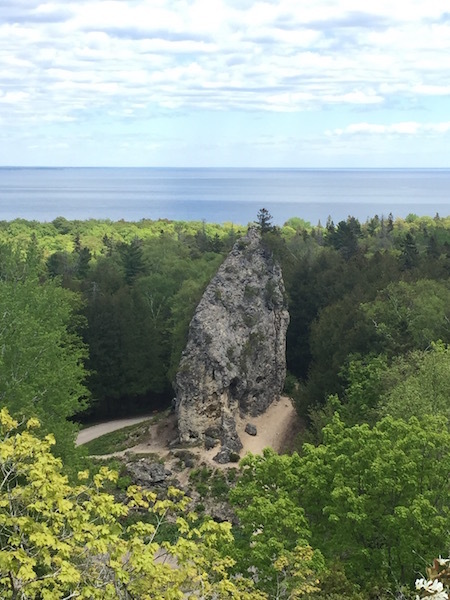 This 75-foot tall rock stands strong in the middle of the island. View it from afar to appreciate its beauty and then take a walk around it to appreciate its immense size. 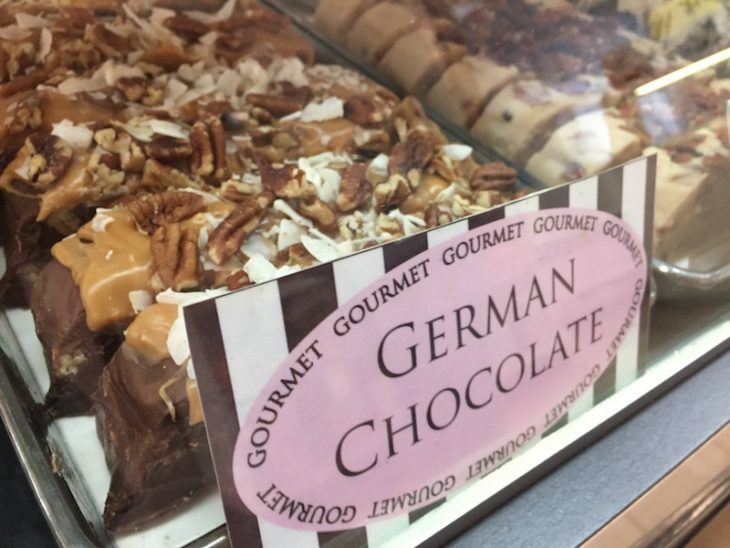 There are approximately 15 fudge shops on Mackinac Island and they all offer free samples of fudge. Watch the fudge makers twists and flip hot fudge on a marble slab while nibbling on their delightful creations. 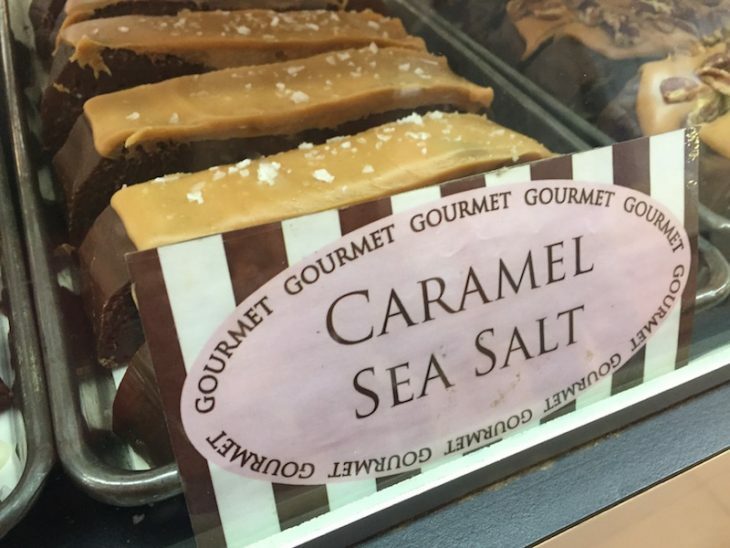 This is great to do right before leaving the island so you can find your favorite flavors and take home a couple of tastes of the island for family and friends. Read more about Mackinac Island fudge here. If you aren’t staying at the Grand Hotel there is a small fee to enter but it is worth it to explore this historic building. 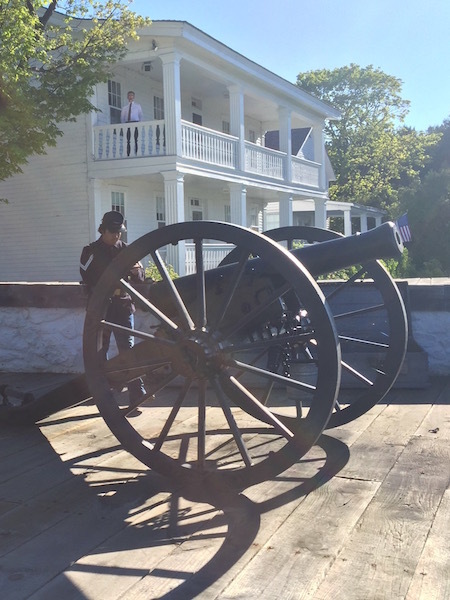 If you can, try to catch a historic tour which is anything but boring and learns more about this historic and famous hotel that has been standing here since 1887. By the way, the hotel’s front porch is the longest in the world and is definitely worth sitting in a rocking chair and watching the world go by. Read more about the Grand Hotel here and here. There are three courses on the island. One at the Grand Hotel with a front and back 9, a historic 9-hole course at Wawashkamo, and an 18-hole putting course at Mission Point. 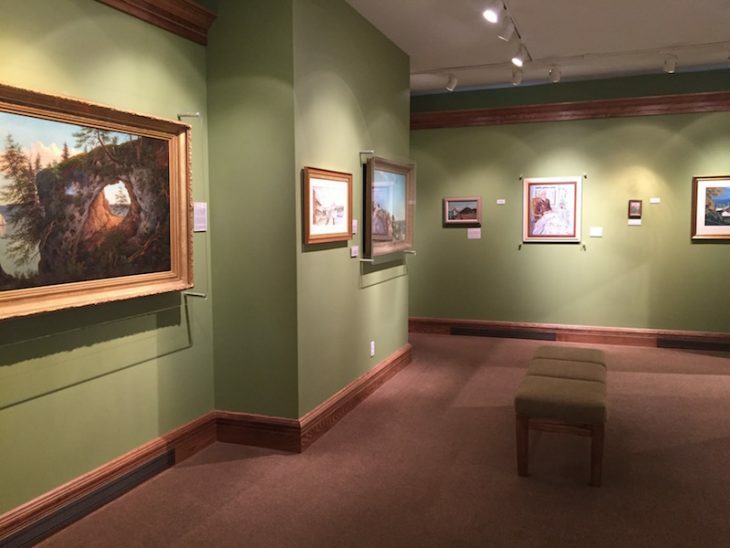 The Richard & Jane Manoogian Mackinac Art Museum, a part of the Mackinac State Historic Parks is located on Main St. at the east edge of Marquette Park and offers art that is centered around Mackinac Island. The Art Museum also offers hands-on art activities for kids for a small fee. Contact them to sign up. This 1800 sq ft tropical garden is filled with hundreds of live butterflies from four continents. Watch them hatch from a chrysalis and take their first flight. There are a variety of shops along Main St. that offers everything from souvenirs to home decor to fashion. The Grand Hotel offers quaint stores both inside the Grand Hotel and on the street leading up to it. Bring your kite and let it fly high. The great lawn at Mission Point is a great kite flying location as is Marquette Park in front of Fort Mackinac. The Little Stone Church was built of local fieldstones in 1904. There are stained glass windows in the front of the church that depict the history of Mackinac Island. Stop and read the historical marker for more history when you visit. 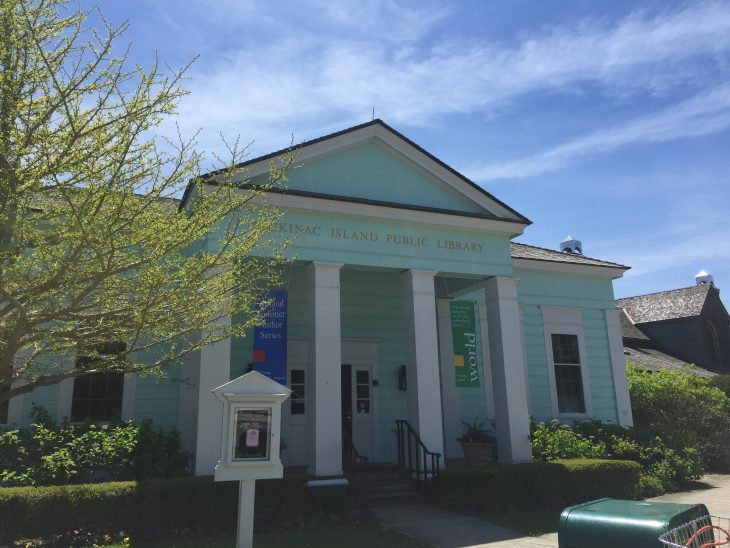 This library may have the best waterfront view on the entire island. A small deck on the back of the library invites you to sit and enjoy a book while watching freighters and ferries pass by. Be sure to check the used book sale section at the library to buy a book to take home or enjoy while you are there. A small squat-ish style cave that was once believed to be the burial ground for Native Americans and was a hiding spot for a fleeing fur trader. Today the cave is free of bones and visitors are asked to view the cave from behind the fence and not try to climb inside. Every Thursday at 7 PM from June 22- August 17 in Marquette Park you can enjoy music in the great outdoors. No worries if it rains, the concert moves indoors to the Center for the Arts at Mission Point. 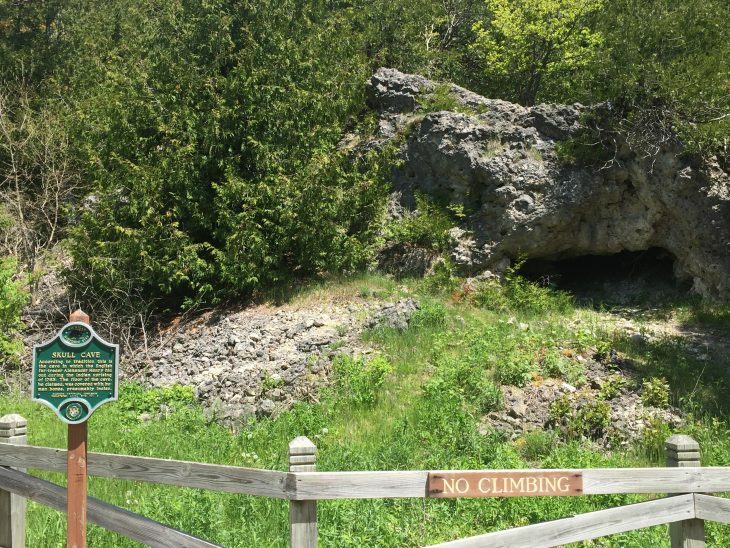 The Haunts of Mackinac offers a look at the eery side of Mackinac Island with stories of days gone by. The walking tour is around downtown and is an easy pace for all fitness levels. This annual event is held at the oldest continuously used baseball field in the state. 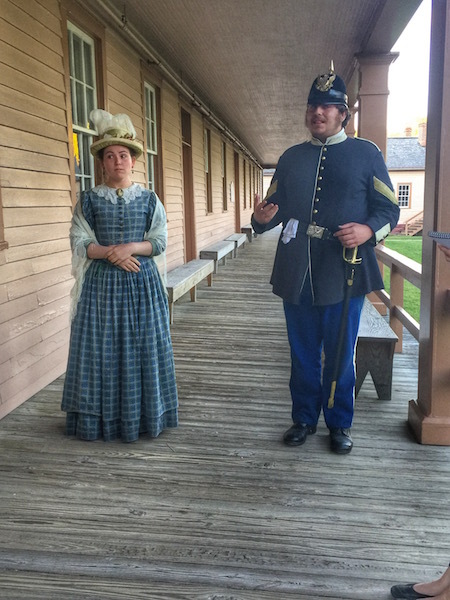 Fort Mackinac Never Sweats will compete against Rochestor Grangers at the game in July. Interpretive signs dot the bike trail around the island sharing the native history that makes this island such a special place ot visit. 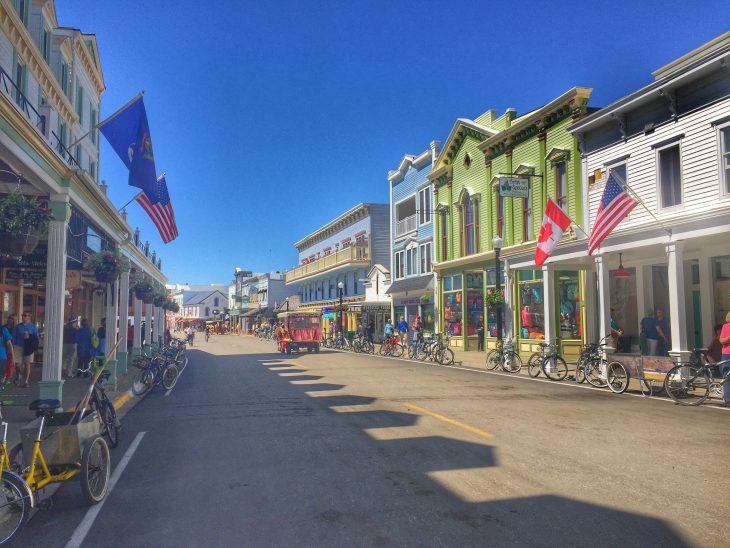 Take time during a walk or a bike ride to learn more about Mackinac Island. Take the reins in hand and experience a horse and carriage ride around the island as you guide the horse. 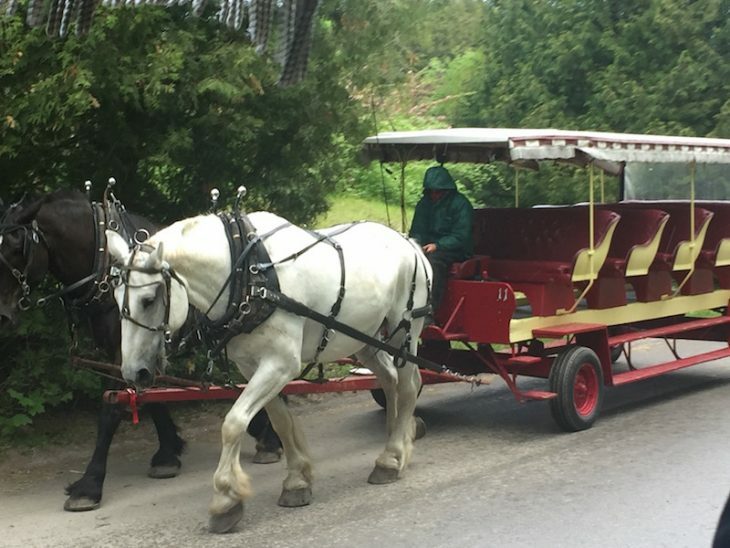 This unique experience is a unique way to truly experience life on Mackinac Island. Your horse and carriage will be much smaller than the one pictured above but if you are staying at the Grand Hotel this is your transportation…so pretty. You can wander around the gardens at the Grand Hotel for free any day of the week, but if you’d like more of a guided garden tour head over to Mission Point Resort. Led by a resident horticulturist the free tours are led every Wednesday at 5:30 & Saturday at 2:30. 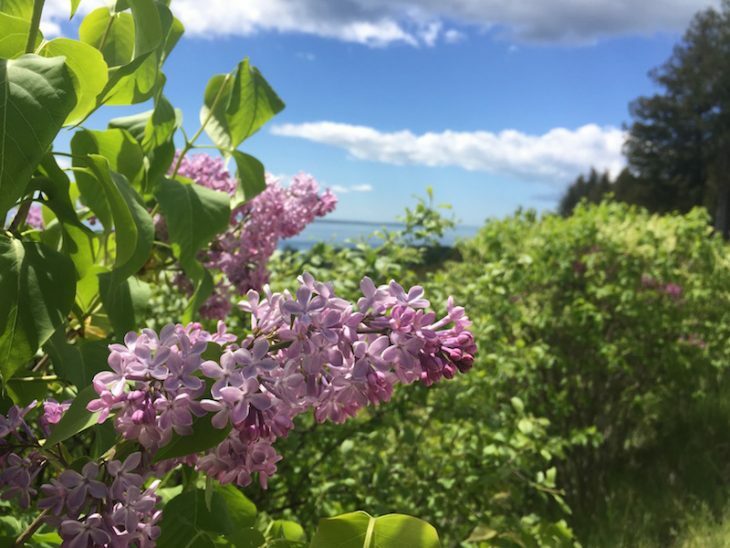 It’s a special bonus if you can visit during the Lilac Festival in June. On Sundays in July and August watch a film under the stars on the Great Lawn at Mission Point Resort. This is one of the best movies under the stars locations. On Tuesday, Sunday and on rainy days enjoy a movie in their historic theater. Hike, bike, paddle, drive a horse and carriage. Whichever mode of transportation you like just be sure to spend time exploring. This little island may be small in square mileage but it is massive in history and natural beauty. Ready to set sail and visit the island? 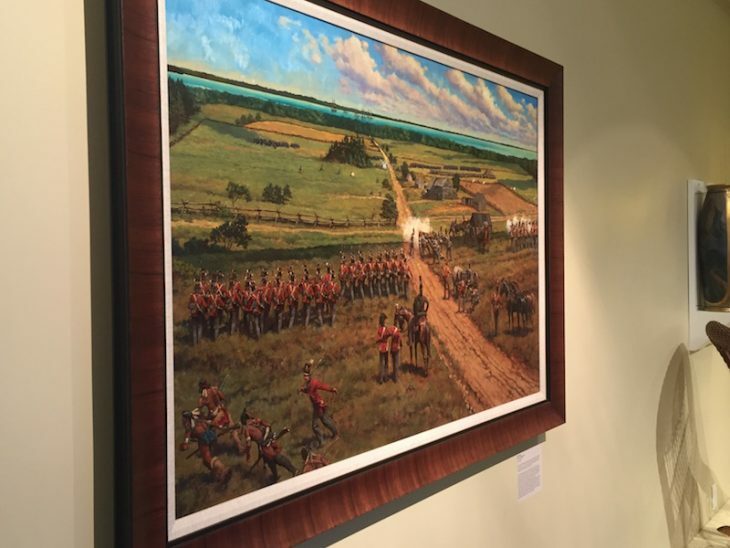 Be sure to buy your Fort Mackinac tickets online. Look at the Family Pass ticket that includes multiple sites on the island and mainland! disclaimer: I was a guest of the Mackinac State Historic Parks. All thoughts and opinions are my own. This post contains affiliate links. What an extensive list. 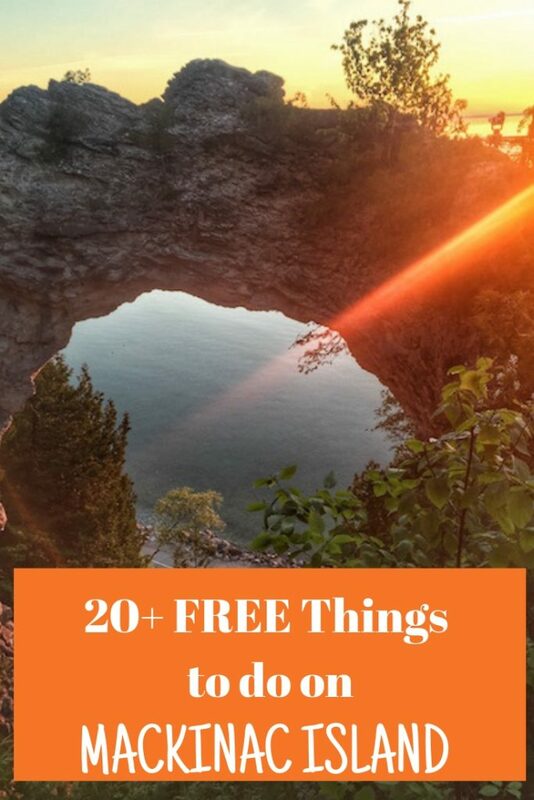 I didn’t know about some of these and will add them to our list this Summer. Such a great list and so creative. I have been to the Island many times and have not done some of these. Can’t wait to explore some of those Somewhere in Time film locations. Nice article. Excellent article! I might have to put this trip on my bucket list! When we worked on the island, one of our favorite things to do at night was ride our bikes to a very dark part of the island (no ambient light) lie on our backs, gaze at the stars, and become one with the heavens!